An important move towards a sustainable campus is made by the Living Labs on campus. This means that research and test environments in real-life situations are set up. TU/e is doing this in close cooperation with students, companies and knowledge institutions. 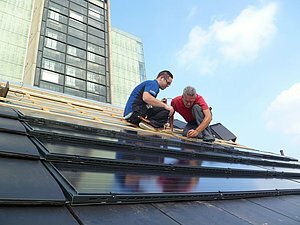 Thus, on the low-rise roof of Vertigo, the premises of the Department of Architecture, Building and Planning, test buildings have been erected whereby solar cells have been incorporated into the roof panels and the tiles. It is a research facility in the area of Building-Integrated Photovoltaic systems (BIPV). The project, which is called SolarBEAT, is a joint venture between Solar Energy Application Centre (SEAC) and the Department of Architecture, Building and Planning. Moreover, in the Hoofdgebouw to be renovated a gigantic Living Lab will be created in cooperation with ILI, which will enable every employee to operate the lighting in accordance with their own desires and needs. The bonus in terms of sustainability is that maximum use will be made of the energy advantage gained by the dimming of LED lighting.